"He's a really good hockey player already," said Johansson, who like Bratt, was born in Sweden. "He's so young, he just got over here, and it's fun to watch." It was the second straight game the Devils got three points from a rookie. Hobey Baker Award winner Will Butcher became the first Devils player to accomplish the feat in his NHL debut during New Jersey's 4-1 win over Colorado in the season opener. The excitement New Jersey's rookies have brought to the ice is infectious, coach John Hynes said. "To get good in the league, you have to draft well and develop well," Hynes said. "The fact we have some younger guys coming into our lineup that can play the way that we want to play and having major impacts on the game, I think brings energy to everyone." "Obviously, not the way we wanted to start the season," Kane said. "We have to have a harder mentality in terms of how we want to play, our compete level needs to be harder. The fortunate thing is, we're only three games into the season." Cory Schneider made 23 saves for New Jersey. The Devils took a 1-0 lead 6:28 into the game when Gibbons flipped the puck from the side of the net and it bounced off Noesen's facemask and past Johnson. Hischier notched his first assist on Gibbons' goal that made it 2-0 with 1:04 left in the first period. Hischier carried the puck behind the net, maneuvered away from Sabres defenseman Marco Scandella and fed Gibbons for a one-timer from the slot. Kane put Buffalo on the board on a power play 5:02 into the second period. Kane got a partial breakaway after poking the puck past New Jersey's Steven Santini and slid a shot around Schneider. 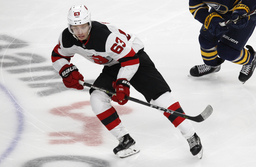 The Devils took 21 seconds to answer with Bratt's short-handed goal on a 2-on-1 with Adam Henrique and Taylor Hall set up Johansson's first goal to extend the Devils' lead to 4-1 less than eight minutes into the second period. Bratt redirected Hall's slap shot for his second goal midway through the second and set up Johansson on a 2-on-1 that made it 6-1 with 1:04 left in the period. NOTES: New Jersey played with 11 forwards and seven defenseman because of lower-body injuries sustained by RW Kyle Palmieri and former Sabre RW Drew Stafford in the opener. ... Johnson made his first start in goal after replacing Lehner during the second period of the Sabres' 6-3 loss to the Islanders on Saturday night. Johnson played 45 games for Buffalo in 2015-16 and spent last season in Calgary. ... The Sabres have allowed four short-handed goals in three games, the same number they allowed all last season. ... Sabres RW Kyle Okposo wore a jersey with his name misspelled "OKOPOSO" for the first period. ... New Jersey started 3-0 in 2014-15.